Day 4 of the America’s Cup Qualifiers saw the beginning of the second round robin series and what may be the beginning of the end for Sweden’s Artemis. Before the start of the day, it was Sir Ben Ainslie and Britain’s Land Rover BAR that appeared to be in trouble. However, by beating the Swedish boat decisively on a day of moderate 12-14 knot breezes, the team put itself in a position where it is just one point behind Emirates Team New Zealand, thanks to the bonus points it earned in the America’s Cup World Series. Equally important, the British sailed a heck of a race, with good speed, a good start and clean maneuvers throughout. As for Artemis, despite being favored as one of the stronger teams going into the regatta, it now has just 2 wins and 5 losses, leaving it with 2 points overall, the same as Groupama Team France and Softbank Team Japan. The Swedish team’s predicament is all the more painful given that it appeared to be well on its way to victory against Emirates Team New Zealand on Day 3 until it drew a penalty in a port-starboard situation at the windward gate. More on that in a bit. Also looking very strong at this point is ETNZ, which has now won 5 of 6 races putting the team at the top of the heap in terms of the challengers. Not only that, but the team seemed to be smooth, fast and very poised as it came from behind on Day 4 to beat Artemis fair and square (no penalties this time!) by a minute and 30 seconds. The looks on the faces of Team Artemis afterward spoke volumes. Which brings us back to that controversial call against Artemis. The general consensus is now that the judges blew it: that although ETNZ had the right-of-way, Artemis gave it plenty of room to safely round the mark. Even the regatta judges have said that if they could do it again, they’d probably call no penalty. That said, I’m not so sure. Port-starboard is port-starboard, and when you’re sailing boats this fast, if you’re on port tack then you darn well better be sure there is absolutely no chance of a collision taking place in a crossing situation, no ifs, ands or buts. Granted, Artemis may have theoretically been in the right, but let them get away with a close one this time around and that will only encourage all six teams to cut it that much closer farther down the road. Next thing you know it’s going to be a pivotal crossing situation in an elimination race and the port-tacker just might try to push its luck—with potentially devastating consequences. We’ve already seen how quickly these boats can go from exciting to dangerous back on Day 1 when Land Rover BAR crashed into the Japanese boat during the pre-start. 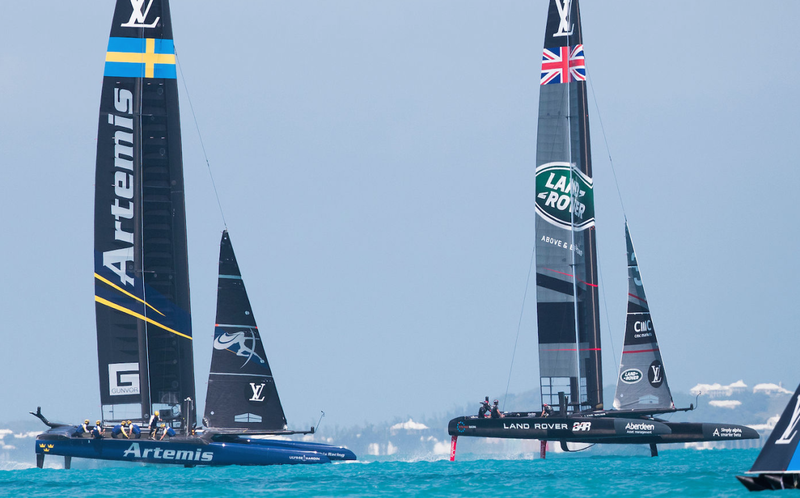 Crashes among displacement cats in the Extreme Sailing Series are one thing. Port-starboard collision on these ACC50s will not only likely end a team’s chances right then and there, but will also likely put multiple crew in the hospital and possibly even their graves. Seriously, people, Formula 1 aspirations aside, sailing is NOT supposed to be a blood sport! More racing is scheduled for later today, though the forecast is for light winds, and whether or not any racing will come off is questionable.